ABD Engineering and Design specializes in corporate workplace acoustics for diverse workspaces enterprise wide, from open office, meeting, and conferencing environments to manufacturing, processing, and distribution facilities. We provide expert acoustical consulting services for Architectural Acoustics, Environmental Noise and Vibration Control, and Audiovisual Systems Design—and work collaboratively on projects that demand expertise from two or more of our areas of specialization. We understand the diverse challenges of corporate workplace acoustics and design expert acoustical solutions to enhance communication, collaboration, and productivity while supporting comfort and safety across the enterprise. 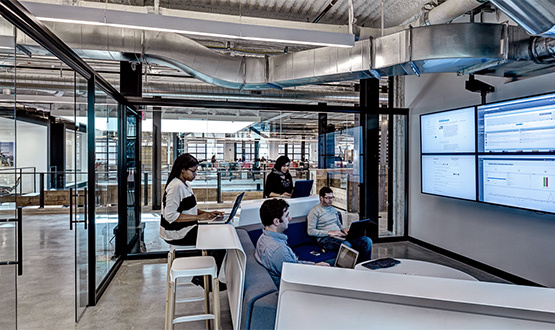 We consult with architects, interior designers, and facilities management professionals to create effective workspace environments that manage sound and control noise—supporting performance, productivity and collaborative workplace objectives. Our acoustical consults use an integrated approach for open, closed, and mixed-use office designs that consider architectural spaces, ceiling, wall and floor coverings and materials, furniture systems and sound masking technology. Our acoustical solutions consider workspace utilization and levels of desired employee and team interaction as well as office speech privacy and confidentiality needs. We also consult with leading office furniture manufacturers, testing and evaluating acoustical performance of new office systems, products, and materials. From the front-end to the backend and across the enterprise, we provide noise and vibration control solutions generated by both indoor and outdoor sources. We analyze office acoustics to develop solutions to control, isolate, or mitigate noise from mechanical systems, office equipment, paging systems and other sources. In manufacturing, processing, warehousing, and distribution facilities, our solutions address noise and vibration generated by machinery, equipment, power plants, traffic, and other sources to ensure workforce comfort and safety and community regulatory compliance. We understand the challenges to reduce, isolate, mitigate, and control noise and vibration across the enterprise and deliver custom solutions. Our expert audiovisual consultants plan, design, engineer, and commission AV systems for video conferencing, telepresence, presentation, training, learning, desktop and mobile content sharing, digital signage, and other communication and collaboration applications. We understand the important role audiovisual technology solutions play in enhancing communications, facilitating collaboration, and increasing productivity. From conference rooms to training facilities, we design scalable, flexible, cost-effective, audiovisual systems and solutions that can seamlessly and efficiently upgrade as technology evolves and your audiovisual applications expand and grow with your enterprise.